Direct your faithful, Lord, in the way of eternal salvation, which the Bishop Saint Apollinaris showed by his teaching and martyrdom, and grant, through, his intercession, that we may so persevere in keeping your commandments as to merit being crowned with him. Through our Lord Jesus Christ, your Son, who lives and reigns with you in the unity of the Holy Spirit, one God, for ever and ever. 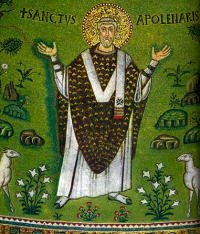 Early accounts report that Saint Apollinaris was ordained Bishop by Saint Peter himself and sent as a missionary bishop to Ravenna during the reign of the emperor Claudius. Renowned for his powers to heal in the name of Christ, he was frequently exiled, tortured and imprisoned for the faith, and finally martyred. This optional memorial is new to the USA liturgical calendar and will be inscribed on July 20. It was dropped from the General Roman Calendar in 1968, at that time this feast was celebrated on July 23. This was the feast of St. Jerome Emiliani whose optional memorial is now celebrated on February 8. Today was also the commemoration of St. Margaret of Antioch, probably a virgin martyr of the third century. Her veneration spread from the East to the West at the time of the crusades. She is one of the Fourteen Holy Helpers. Elias the Prophet's feast is celebrated today by the Eastern Church. He is revered as the spiritual Father and traditional founder of the Catholic religious Order of Carmelites. In addition to taking their name from Mt. Carmel where the first hermits of the order established themselves, the Calced Carmelite and Discalced Carmelite traditions pertaining to Elijah focus upon the prophet’s withdrawal from public life. The medieval Carmelite Book of the First Monks offers some insight into the heart of the Orders' contemplative vocation and reverence for the prophet. Apollinaris came to Rome from Antioch with the prince of the apostles, by whom he was consecrated bishop, and sent to Ravenna to preach the Gospel of our Lord Jesus Christ. He converted many to the faith of Christ, for which reason he was seized by the priests of the idols and severely beaten. At his prayer, a nobleman named Boniface, who had long been dumb, recovered the power of speech, and his daughter was delivered from an unclean spirit; on this account a fresh sedition was raised against Apollinaris. He was beaten with rods, and made to walk barefoot over burning coals; but as the fire did him no injury, he was driven from the city. He lay hidden some time in the house of certain Christians, and then went to Aemilia. Here he raised from the dead the daughter of Rufinus, a patrician, whose whole family thereupon believed in Jesus Christ. The prefect was greatly angered by this conversion, and sending for Apollinaris he sternly commanded him to give over propagating the faith of Christ in the city. But as Apollinaris paid no attention to his commands, he was tortured on the rack, boiling water was poured upon his wounds, and his mouth was bruised and broken with a stone; finally he was loaded with irons, and shut up in prison. Four days afterwards he was put on board ship and sent into exile; but the boat was wrecked, and Apollinaris arrived in Mysia, whence he passed to the banks of the Danube and into Thrace. In the temple of Serapis the demon refused to utter his oracles so long as the disciple of the apostle Peter remained there. Search was made for some time, and then Apollinaris was discovered and commanded to depart by sea. Thus he returned to Ravenna; but on the accusation of the same priests of the idols, he was placed in the custody of a centurion. As this man, however, worshipped Christ in secret, Apollinaris was allowed to escape by night. When this became known, he was pursued and overtaken by the guards, who loaded him with blows and left him, as they thought, dead. He was carried away by the Christians, and seven days after, while exhorting them to constancy in the faith, he passed away from this life, to be crowned with the glory of martyrdom. His body was buried near the city walls. Symbols: White vestments and black cross; club; hot coals; raven; crown; stones; cauldron of boiling water; chains; sword. Often Portrayed As: Bishop with a club; standing or seated on hot coals; bearded, in a chasuble and pallium, with sheep around him; preaching to sheep. The Basilica of St. Apollinaris is considered the cradle of the Christian Faith in Italy and preserves the body of St. Apollinaris. Read the Pope John Paul II's message on the 1,450th anniversary of the dedication of the Basilica and view some of the beautiful mosaics in the Basilicas of St. Apollinaris and St. Vitalis (German site - click on the main graphic, you don't have to speak German to enjoy the beautiful pictures!) and also this site on Ravenna Mosaics which includes some history. This link gives a little information about Byzantine Italy. More pictures and maps. This link will give you the historical background on how Ravenna, Italy ended up with the glories of Byzantium in its Basilicas. Read what the Catholic Encyclopedia says about Ravenna. St. Margaret's feast has been suppressed because there is not much historical information about her life. There was great devotion to this saint, especially during the Middle Ages. She is one of the "Fourteen Holy Helpers" and one of the saints that appeared and spoke to St. Joan of Arc. "This same day brings before us a rival of the warrior-martyr, St. George: Margaret, like him victorious over the dragon, and like him called in the Menaea of the Greeks, the Great Martyr. The cross was her weapon; and, like the soldier, the virgin, too, consummated her trial in her blood. They were equally renowned in those chivalrous times when valor and faith fought hand in hand for Christ beneath the standard of the saints. So early as the seventh century our Western island rivaled the East in honoring the pearl drawn from the abyss of infidelity. Before the disastrous schism brought about by Henry VIII, the Island of Saints celebrated this feast as a double of the second class; women alone were obliged to rest from servile work, in gratitude for the protection afforded them by St. Margaret at the moment of childbirth—a favor which ranked her among the saints called in the Middle Ages auxiliaries or helpers. But it was not in England alone that Margaret was invoked, as history proves by the many and illustrious persons of all countries who have borne her blessed name." Patron: against sterility; childbirth; dying; escape from devils; exiles; expectant mothers; falsely accused people; kidney disease; loss of milk by nursing mothers; Lowestoft, Suffolk, England; martyrs; nurses; peasants; people in exile; Queens College Cambridge; women; women in labour. Symbols: Chained dragon; dragon burst asunder; girdle; sheep; garland of pearls; daisy; wreath of marguerites; long cross; crown. Often Portrayed As: shepherdess; woman carrying a small cross in her hand; woman carrying a small girdle in her hand; woman leading a chained dragon; woman standing next to a cauldron or large vessel; woman standing with, on, or beside a dead dragon.